Sutton Street Store co-owner Peter Nolan with the lamb meal vending machine. AFTER hours lamb lovers are flocking slowly to Australia’s first sheep meat vending machine in the New South Wales town of Cootamundra. Despite some minor technical issues, Sutton Street Store co-owner Peter Nolan said the vending machine is averaging about 30 meals a week just five weeks into the first commercial trial. “It is going quite well in that respect,” he said. 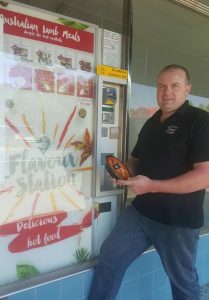 The Flavour Station vending machine product was developed by Victorian lamb processor Robert Frew and UK-based consultant Koorosh Khodabandehloo to tap into the booming billion-dollar ready meal market. The cashless vending machine stores 80 chilled pre-cooked meals that are served hot in a few minutes, but to be viable each machine needed to sell 15-20 meals daily, 300 days a year. The machines can be monitored remotely to assess temperature and stocks. The vending machine meals sell for $10 each and were developed to value-add lamb trim from Frewstal’s Tier II processing plant at Stawell, which processes 12-30kg cwt lambs for domestic and overseas customers. The plant is currently undergoing a $1 million expansion to construct new truck access facilities, refurbish the stockyard, build elevated walkways and install a new guardhouse and boom gates. Mr Nolan said he expected the technical issues with the vending machine to be resolved by the end of the month and after a couple of months of “smooth sailing”, more machines will be rolled out in other centres nearby. Mr Nolan is a trained butcher and has extensive experience as a meat processing plant manager. As the new owner of the Sutton Street Store with wife Julie, he is extending its food range into gourmet meats and convenience meals. Cootamundra has become the hub for future expansion of the lamb meal vending project due to Mr Nolan’s long association with Mr Khodabandehloo, and the availability of support from a technical expert living in the NSW town. The store also has a kitchen for preparation for the vending machine meals. Mr Nolan said early morning or late night workers such as shift workers and truck drivers looking for a quick convenient meal were the main customers of the Cootamundra machine. Mr Nolan said an advertising campaign for machine sales would begin when technical and service issues with the vending machines are resolved. The meals might also be varied and renamed to be more familiar to Australians. The project will continue to explore its lamb meal options, he said. “There are plenty of opportunities there, although it was designed around that trim. Victorian treasurer Tim Pallas toured the Frewstal plant recently to inspect the final stages of construction, will safeguard more than 450 existing jobs in Stawell. The Labor Government has invested $500,000 in the $1 million project. The expansion project has created opportunities for Frewstal to increase its meat exports to the Middle East, China, Malaysia, Indonesia and the United States of America. This project is part of the Labor Government’s $21.9 million landmark plan to create local jobs and secure Stawell’s future. Mr Pallas said the government was helping grow Frewstal as one of regional Victoria’s major employers and ensure that local jobs and the Stawell community are given the chance to thrive in what is a tough time for all. Minister for Agriculture and Regional Development Jaala Pulford said the Frewstal abattoir is the biggest employer in Stawell and the government’s support would see it expand and give more in the Stawell community the opportunity to kick-start their careers.